Well GB has been on a winning streak since their bad start. They seemed to have a lot of injuries last week though while Dallas had the week off. So Dallas has every advantage as far as the schedule and home field. Interesting. I can't actually watch since I have to be at work this morning (It's Monday morning for me) but if Dallas pulls this off, it will be an amazing comeback. Good job for Rodgers and Green Bay. Last edited by Anaxagoras on Mon Jan 16, 2017 1:02 am, edited 1 time in total. Oh indeed. I was about to "call it" in the first half. Hard to believe Cowboys did not get the final field goal. I don't think it's fair that Greenbay can just use magic like that, in front of everyone, and no one calls them out on it. Chin up, Cowboys fans. Yankees Spring Training is right around the corner. Last edited by Doctor X on Mon Jan 23, 2017 5:31 am, edited 6 times in total. That would make them . . .
Cowboys are the Yankees. The Patriots: having good ownership; one of the best coaches ever; and a starter who is beloved by fans and respected by the peers, and who will also retire with the same team and played through several dynasties, well that makes them more like Lakers. 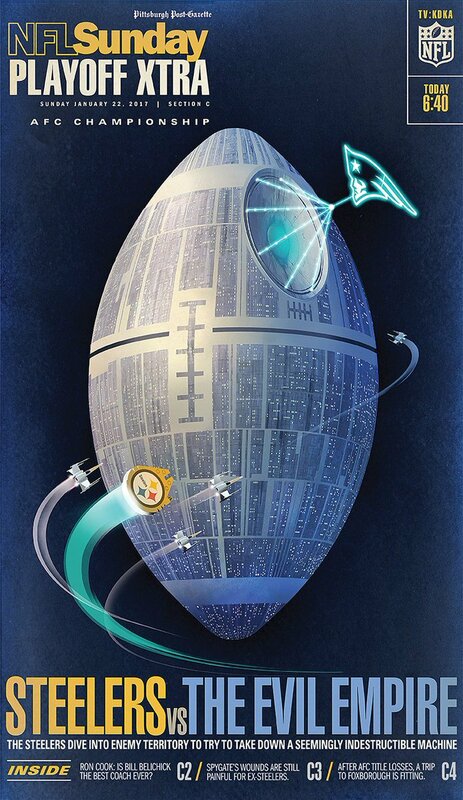 That Death Star looks a bit deflated.